Jim Elyea co-runs History for Hire, a prop house in Hollywood, California, and has provided props for a variety of movies, television shows, and music videos. Recently, Jim spoke with us about the different types of props and the different eras that History for Hire covers, as well as the steps he takes to make sure an item or scene setting is historically correct. Jim can be contacted via the History for Hire website. 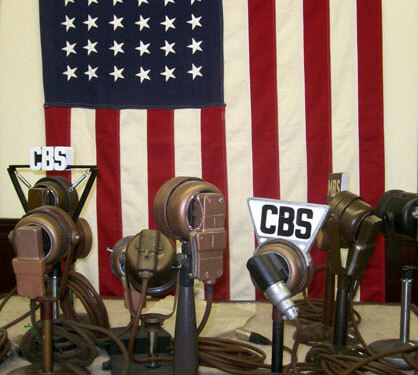 These History for Hire microphones were featured in Martin Scorsese's The Aviator. When I was a kid, my mom had an antiques shop in Kansas City and then in Texas, so I was always around antiques and I always collected things. At one point, I would buy things and then sell them through our shop. She let me put things on consignment. So it was always in my blood. In 1985, I just wasn’t having a good time as an illustrator, which was what all my training was in, so I said to myself, “What do I do when no one’s paying me?” and I realized I was running a rental facility. By this time I had accumulated large amounts of costumes and props and all sort of things. So I talked my brother Bob into becoming partners with me. We rented a storefront in north Hollywood and brought over everything we had. At first we decided to have costumes and props. It seemed like a good idea at the time, but it wasn’t, so after about nine months, we came to our senses and sold off all the costumes and kept the props. Then it grew and grew, and now we’re in our third location. We went from 4,000 square feet to 7,000 to 17,000, and now we’re at 32,000 square feet. It’s a big warehouse full of out-of-date technology. We don’t carry furniture and we don’t carry costumes, but we do carry what goes on these things. For instance, if you were doing a period newspaper office, you’d get the desks from someone else, but we have the lamps and all the goodies that went on top of them. If you were doing a war film, you’d get the uniforms from somebody else, but you’d get all the equipment and leather gear from us. Anything is potentially a prop, and there are places that are many times larger than we are. Most of them carry furniture, but you can really overwhelm yourself with furniture quickly. We try to stay away from furniture because the pieces are so big, and you can’t just carry one kitchen table. You have to carry 10 kitchen tables to be competitive, plus 10 sets of chairs. It’s a space issue. We joke in our business that if you’re doing it right, you have a space problem. This December we’ll begin our 25th year in business. Our first big show was Platoon, and that was back when we did wardrobes, so probably 95 percent of everything you see on screen came from us. Collectors Weekly: Are there specific types of movies that you cater to? Elyea: We like to think we have everything, but there are some categories that tend to be disproportionately popular. We refer to them as the Ms: music, motion picture, media, microphones, and military. For instance, if there was a rock-and-roll film made in the last 25 years or so, we probably had a big part in it. We ship music equipment practically every day. We tend to get a lot of military requests, too, and any show about making movies that’s been made in the United States since 1990 used our equipment. A lot of times we have stuff that corporations don’t have. For instance, we’ve rented television cameras to NBC and ABC and CBS for their retrospectives. We’ve rented cameras and things to the Emmys. Most places don’t hang on to that sort of stuff. We’ve done World War II a lot. It’s a marvelous era to graft your story onto. It’s arguably the last good war, and perhaps the only one. World War II was about good versus evil. Even X-Files and Star Trek and several other shows have had episodes where they had aliens who were basically wearing World War II Nazi uniforms. Here’s something that’s set in the future in space and yet to make them the quintessential bad guys, they put them in clothing that looks like World War II German uniforms. We’ve shipped to every continent in the world, including Antarctica. We’ve shipped rickshaws to Japan, and we’ve shipped ski goggles to Norway. It’s crazy. We will often have something that the original company has long since gotten rid of, which is fun. Having a prop house is a great thing for a packrat. I can collect professionally so my home can be halfway normal. The only things that I collect personally are Vox amplifiers. They’re the ones that The Beatles and everybody used. Actually, I’m so into them, I wrote the definitive book. It has its own website, voxguidebook.com. Collectors Weekly: How many different departments do you have in the warehouse? 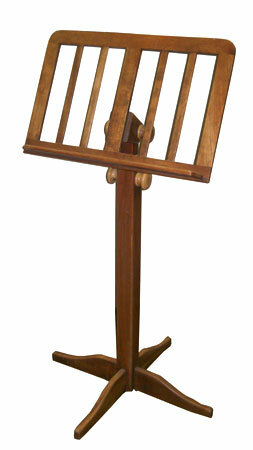 A music stand used in James Cameron's Titanic. Elyea: Probably a couple of hundred. We have kitchen items and home furnishing items and musical instruments and barber items and cosmetic items and Mardi Gras heads and watches and rings and parasols and umbrellas and eyeglasses and sunglasses and microphones. It goes on and on. We tend to stop in about the 1970s and ’80s, unless it’s media or newsgathering equipment. We do all years of that. If you’re doing something from the 1920s through the 1940s, we have such a depth of items that we pretty much have anything you can think of in what’s known as small or hand props. Around a dozen people work for History for Hire. Each person specializes in a specific area. For instance, we had propped a show about the Runaways, the girl group in the ’70s, and as happened, Seiji Kobayashi is not only the head of our musical department but an enormous Runaways fan who went to see simulcasts of them when they went to Tokyo, which is a big part of the movie. So he actually went on set and helped with the instruments and tech advice, not only on the musical stuff but on Japan, too. He made these special paper fans for the girls in the audience, which was apparently really common to very traditional Japanese fans, and he put messages on them for the people on stage. Without Seiji, we never would’ve known about that. Everybody here knows a lot about a lot, but there are some people who really nitpick about the details of certain areas. One of the things that our philosophy is based on is to try and make movies and television better and more historically accurate by putting the right things in them. Our motto with our clients is, “We’ll tell you what’s right, and then we’ll rent you anything you want,” because a lot of times, even though we know better and they know better, their boss wants something different. The director wants it different or the actor wants it different, and ultimately, they’re the ones calling the shots and paying the bill. But we’d like to think that stuff looks a lot better and is more accurate because we’re around. Collectors Weekly: How do you go about making sure something’s historically correct? Elyea: Pretty much the same way as a collector would—by dating your collection. For example, if a doll came out in 1867, it wouldn’t be appropriate for a Civil War movie, which ended in 1865. But it could be that your only choices are that doll or one from the 1880s, so sometimes you pick the lesser of two evils. The 1867 doll is technically not right, but it’s much closer to being correct than the 1880s doll. There are an enormous number of people who care passionately that things are historically accurate. There are a number of barriers that get in the way, a number of reasons why one might have a hard time getting something accurate. One of them is what we mentioned a minute ago, when the director says, “Yes, but I want the different one.” You can’t fight that; you just have to do it. Then there are times when everybody knows what’s right and everybody cares deeply and everybody’s ready to do it, but you just can’t come up with it in time. Ultimately, just like you can’t have dead air on the radio, you can’t have somebody in the film theoretically waving something around that’s not there. Whether it’s historically right or wrong, it still has to be in that actor’s hand. So ultimately, whether something is historically accurate or not, there has to be something on screen. Collectors Weekly: If someone needs a prop that you don’t have, what do you do? 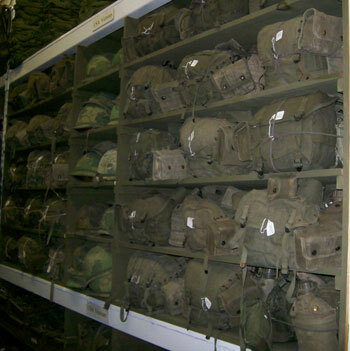 Just some of the military gear supplied by History for Hire for Oliver Stone's Platoon. Elyea: It depends. If it’s something that for one reason or another we want to acquire, which usually happens with feature movies, because there’s often more time to do that, we’ll search for it or make it. When we did The Patriot, we made almost everything. We did between 100 and 200 sets of equipment for the soldiers because, besides the fact that the originals are 200 plus years old and ratty, they’re museum pieces and if they’re in fantastic condition, you’d never ever want to take one out. So that stuff has to be made again. With props, if you can’t tell it’s been remade, then we’ve done our job. The gentleman who runs our custom shop is named Gary Aardahl, and he’s amazing. One day he’ll be making a scabbard from 1755, and the next day he’ll be working on a 1950s television camera. He’s the supreme craftsman, and he just has the standard that everybody else has to live up to. We recreate props pretty much every day. Sometimes it’s just repairing something. Usually things have to look new, so we have to do a restoration job on them. It’s more important that it looks right than that each element is an original, authentic antique. Say you have a food scene in 1775. You have some people sitting around, eating and drinking. You could use original antique plates that are crazed, have little stains on them, that look good for antiques but still show their age. Or, you could have reproductions that look brand new. What would be the more appropriate thing to have? It depends on the film. Collectors Weekly: How often do you have to go through your inventory to make sure everything is in top shape and ready to go? Elyea: The goal is to have everything perfect and wonderful all the time. The reality is that we have so much that we’ll generally pick a section to refurbish. Once a month is “air up all the tires” day, which is an entire day of somebody’s time spent running around with a little compressor to make sure there’s air in all of our tires. We have bicycles and different cars, and some of our moviemaking equipment has tires, too. For The Aviator, we built a 1920s era camera dolly, which is a big wooden platform on a Model T suspension, so we have to air up the Model T tires. And then we have the rickshaws. Speed Graphic cameras are an important part of what we do. We have about 80 Speed Graphics from different eras, including the so-called pre-anniversary models from 1928 to 1939, and we just finished a big six-month project earlier in the year where we went through every camera and made sure that everything was tight, the flashes worked, all the bits and details were right for that particular era, etc. And then we cleaned them up and made them all nice and wonderful. 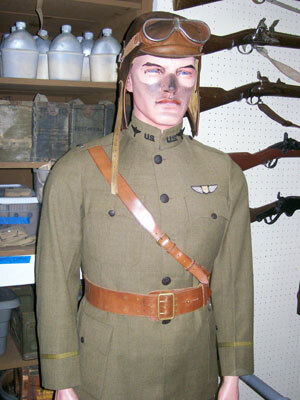 A World War I pilot uniform, used in Michael Bay's Transformers: Revenge of the Fallen. We’ve gone through and restored a lot of the first-generation ones, the ones that came out before 1928. Back then, the flash arms were different—the early ones were actually converted flashlights. So we took vintage flashlights and created our own flash arms from scratch. Many of the parts for the early speed graphics aren’t available so we’ve had to remanufacture them. I didn’t make any extras, and none are for sale. If it’s a show we’ve done already, we’ve already done the research, so we know what the prop master needs. So for instance, if you came in and said, “I’m doing press and it’s 1930,” we’d say, “You can use a pre-anniversary camera because it came out in 1928, but you can’t use a flashbulb because those weren’t commercially available until about 1931, ’32.” Usually the client will say, “The director wants flashbulbs,” so we’ll give them an era-correct pre-anniversary with the earliest flash attachment that came out. The other thing we have is a really large research library in our warehouse—it has about 5,000 books. It’s our own library, not for public use. We have books on just about everything we carry. We have a lot of auction catalogs, including huge ones on sports memorabilia and music- and motion-picture-related items. Periodically there’ll be an auction of some star’s estate, so the catalog will be filled with fantastic pictures of their stuff. So if we ever have to recreate them in a film, we can just go and look it up. We also have a series of Montgomery Ward catalogs from virtually every year of the 20th century up until they stopped producing them. We use those all the time. Say you’re doing a 1928 movie. We’ll look in the 1928 Montgomery Ward catalog to see the most up-to-date stuff that an average person would have. Say you want a picnic cooler. You can see what picnic coolers looked like in 1928. Or you might go back to 1921 because you’re story is about people who weren’t necessarily as cutting edge, so they bought their cooler eight years before. A lot of times we use catalogs to find out when a particular product was introduced. You look through a succession of years and you won’t see it, then, all of a sudden it appears. It’s a good bet that that’s the first year they became commercially available, or at least in widespread use. I think the stupidest thing I ever rented was an old stove knob. Why they needed it, and why I had it, I don’t know, but I got a quarter for it and they brought it back. Collectors Weekly: Have you ever had problems with people not returning things? Elyea: It’s a chronic problem. Most of it has to do with just the hurry-up nature of film production. Things slip through the cracks. If somebody loses something from a prop house or if they break it, they’ll end up paying two or three times the market value for it. As a group, we really don’t like it. I had this 1880s tea set that had four cups and saucers plus a pitcher, just a lovely piece. The first time we rented it, somebody broke a couple of the saucers. I didn’t that say it out loud, but I thought, “This thing survived for over a hundred years and you have it for a week and you can’t even keep it intact.” But usually that’s the result of the production company hurrying up our clients, not giving enough time to do something correctly. All our clients are wonderful. Collectors Weekly: What are some of the movies that have used your props? 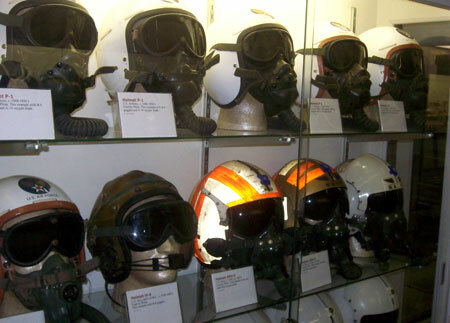 These flight helmets were used in Michael Bay's Transformers: Revenge of the Fallen. Elyea: Let’s see, Titanic, Year One, Public Enemies, Transformers 2, That Thing You Do. Here’s a lovely story about That Thing You Do. They shot it at the Ambassador Hotel, for the hotel room and coffee shop scenes. When the hotel shut down, we bought a lot of the hotel’s silverware at their sale. We rented that same silverware to the movie for that scene, so it actually played itself. For Good Night, and Good Luck, we did all the TV and film equipment. In the offices, everything on top of the desks up to, but not including, the fluorescent lights was ours. We rented 60 period telephones. So it varies. There are other times when we’ll only have two pieces in a show. We do films and television, but we also do music videos and commercials and fashion shoots. We do a lot of stuff for “Italian Vogue” and “French Vogue.” If it’s in any sort of popular culture, we’ll do it. We’ve rented to Jay Leno. We’ve actually done some work with American Idol and shows like that, generally microphones. Here’s a fun one. We have a very authentic electric chair, and it’s so good that if you hook somebody up, it would work. But Quentin Tarantino, Billy Bob Thornton, Snoop Dogg, and Madonna have all been grilled in our electric chair. Billy Bob Thornton actually badgered us. He wanted to buy it, but it’s not for sale. We never sell anything. We never get rid of anything, so we have lots of things available for our clients. Plus most studios don’t like things to go out onto the open market unless they sell it themselves. Sometimes when a movie comes out, some studios will sell off some of the props on eBay to raise awareness of a film. Collectors Weekly: How do you acquire items? Elyea: We get things every way you can think of, and more. It’s not particularly different from any collector who’s going to be reading this. There are special shows for train items or advertising items or paper ephemera or whatever. There are specialty shows. There are antiques shops and antiques malls. I don’t garage sale very much, I don’t want to get up that early, but eBay is good if you have the time. Right now I’m not buying anything. We have everything that we need, and it’s been a hard couple of years with the writers and then the actors going out on strike. So I’d rather pay my employees than buy more stuff for a while. We’ll be back to buying sometime next year. Collectors Weekly: If you’re looking on eBay or at a sale, are you after a certain level of quality or just a certain type of prop? Elyea: Quality always has to enter into it in one way or another. Part of it is serviceability. Even if it sounds like a bargain, if we have to put lots of labor into it, we’re better off buying the better quality one, even if it is more expensive. We don’t cut corners. The turntables work and we polish up the leather and we make sure everything looks nice and is in good condition. Collectors Weekly: Are there times of the year when some props are in higher demand? Elyea: Yes. It used to be that July and August were hiatus months. That’s when most TV shows would be down for the summer. Now with all the different cable channels and changes in the business, you have shows going on hiatus all the time. Some of them are really ramping up for the fall, whereas Mad Men shot its last episode yesterday and won’t be back in production until April. So it varies. Usually most features don’t want to pay people to be off for Christmas, so they try to wrap up before then. A lot of features start in late January. And December and early January are always busy with Super Bowl commercials. So it is seasonal, but it’s a bunch of different seasons. We used to be able to prepare for certain seasons really well, but now it changes so much that it’s hard to predict. The only rule of thumb is that the longer the slow period, the busier it’ll be when things gets busy. Collectors Weekly: Did you help prop Mad Men? Elyea: We did a lot for Mad Men. They own many of the things they have in the offices because they need to have them year after year, but we get calls for special things. For instance, there’s a shoebox full of money that one of the lead characters has, and we rented them the shoebox and the vintage currency. My favorite part about the show is how they show how lax and careless we were with certain safety issues. There’s one lovely scene where this little girl comes to her mom and she has a plastic cleaning bag over her head and she’s using it as a toy. You think the mom’s going to freak out, but she just says, “Now, now. Did you wrinkle my dress when you took it out of that bag?” and lets her go. Collectors Weekly: What are some of the really random or obscure things you’ve learned? 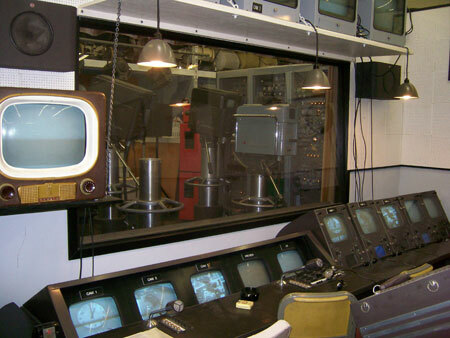 History for Hire supplied the control room for George Clooney's Good Night, and Good Luck. Elyea: We’ve probably learned more than we need to about clothespins. We’re working on a movie right now about the co-conspirators with John Wilkes Booth, who killed Abraham Lincoln. We’re studying the photographs of the execution and identifying each person by what they were wearing. Sometimes you can learn a lot from photographs of an event like that. In The Aviator, there’s this series of scenes in 1947 when Howard Hughes is called before a Senate committee. They take place over three days, so I spent a couple of months researching and coming up with every photograph I could and then putting them together, judging by the microphone placement what day it was. So we bought and made microphones. We made stands. We did an enormous amount of work on this one. We basically made paper layouts for each day. If you’re shooting day one, put microphone A here and microphone B here, C here, etc. There were probably a couple of dozen microphones that were set up. The layout was perfect and matched all of the original photos. For way too long, I was living and breathing this one sequence, and unless you wanted to talk to me about microphones, I wasn’t much good to anybody. But the client loved it and appreciated it, and of course he moved a couple of microphones around because he wanted it in a certain spot. But generally speaking, it was probably 98 percent perfect. Collectors Weekly: How often do you just get completely engulfed in researching something like that? Elyea: Usually it’s almost always for a feature because there’s just not the time to do it otherwise. We did that with Good Night, and Good Luck. It was very important that everything was just right, so we watched a lot of footage and looked at photographs and specially made things. That was one for which we devoted enormous amounts of detail. Collectors Weekly: What area have you found yourself becoming more interested in as the business has grown? Elyea: Vintage baseball equipment. We don’t cover modern baseball, but when we did the movie The Babe, Gary (who runs the custom shop) and I went to the Hall of Fame at Cooperstown. It was so cool. They let us in the back, and we got to photograph all kinds of things. We got to photograph one of Babe Ruth’s original bats with 26 notches in it, each one representing a homerun. We knew we would be doing other baseball films, so we also researched a lot of other eras as much as possible. We can do a whole baseball scene for most of the first 60 to 70 years of the 20th century, including the bases, the line markers, the baseballs, you name it. Collectors Weekly: Do you have a favorite era of props? 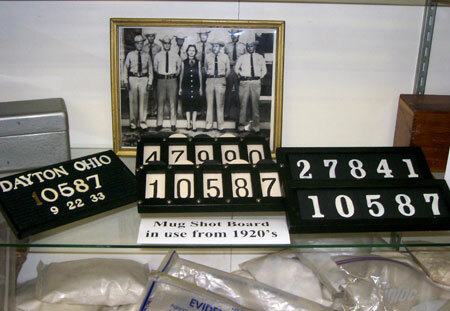 Authentic booking numbers used in Michael Mann's Public Enemies. Elyea: I like the ’30s. It’s just fun to work on. I like the clothes from the era. That said, one of the things that’s really fun about what we do is that we’ll work heavily on one thing and then we’ll switch to something a hundred years different, or a lot of times we’ll be working on several different eras at once. Right now we’re doing a movie about the Scopes trial from 1925, the one I mentioned about the Lincoln conspirators in 1865, and we also just finished a film that was set in ’57 and ’62. We’re doing a recording studio set in the 1990s for Cold Case, and we just did props for Army Wives, which is set in World War II. So it’s fun bouncing back and forth between the eras. We were talking at lunch about how with most jobs, once you learn the job, that’s pretty much it. Our jobs are really fun because no matter how much you know, every day you’re asked to learn something new, and that’s great. Learning every day keeps your brain going. You have my dream job! Thanks for the great article and interview. Researching the history of “stuff” is what I do as an estate liquidator. That knowledge make me watch TV and movies with a very critical eye. It is not unusual to hear a song that had not been written or a slang phrase that is not time appropriate. It’s good to know about “History for Hire” and other “stuff” censors doing their job while having so much fun! Keep up the excellent articles, Collectors Weekly! “ ” It was like opening a door and going through the other side, becoming a brand new person.